John Mengatti, Paul Stout, Scott Stout, Ralph Seymour, and Jason Hervey wear black high top Converse “Chuck Taylor” All Stars in the film. Ted, Steve, the twins, Butterball, and Tommy are just about to discover Meathead. This 1984 sequel to the original film that starred Bill Murray revolves around a border-line juvenile delinquent nick-named Flash (John Mengatti) who is given the choice of being a counselor in training at Camp Sasquatch or going to reform school. 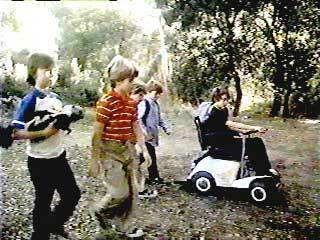 He is put in charge of a group of young adolescents who include Tommy (David Hollander), a disabled but cocky kid who drives to camp in a motorized wheelchair, identical twins Barry and Larry (Scott and Paul Stout), Butterball (Scott Nemes) the nerdy kid with horn-rimmed glasses, Steve (Jason Hervey) a young entrepreneur who markets candy and other items, and Ted (Chad Sheets) who comes to camp with some stuffed animals. Camp Sasquatch is run by Coach Giddy (Richard Mulligan) who quickly tries to enlist Flash to spar with his camp boxer Boomer (Joe Nipote). When Flash actually gets into the ring with the slow-witted Boomer, Giddy finds out that Flash has natural boxing skills, although not a lot of experience in a real bout. Flash spars with Boomer while Giddy looks on. 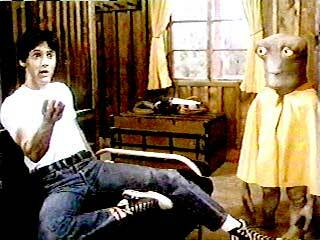 The film quickly borrows a story line from E.T., only this time the alien (Felix Silla) has a Jewish accent, and was sent to camp to earn his “Earth” merit badge) The alien is quickly discovered by the six boys (and gets his name “Meathead” from repeating “me, Ted” when they first try to communicate). Meanwhile, the rival Camp Patton, run by Colonel Hershey (Hamilton Camp) and his sidekick Lt. Foxglove (John Larroquette) try to put Camp Sasquatch out of business by purchasing the entire lake that the both camps sit on. Giddy counters by bringing in a busload of Hari Krishnas, and threatening to turn Camp Sasquatch into a religious retreat. This upsets the Colonel greatly, since he wouldn’t be able to run his military maneuvers against pacifists, so eventually the two of them agree to settle the ownership issue with a boxing match. Of course, all kinds of hijinks occur prior to the fight. Hershey sends a squad to take out Boomer, and they end up breaking his arm. This leaves Flash to take up the challenge against the Camp Patton boxer, who you initially see locked in a cage, and being fed raw steaks. 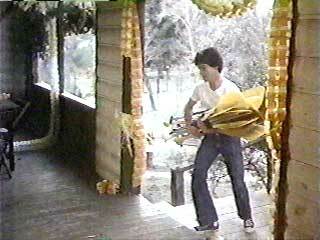 Flash waits for Cheryl by the lake. The film’s dialogue and story line is filled with sexual innuendos, adolescent genitalia humor, and the usual co-ed camp pranks and romances. One ongoing bit throughout the film (and continued from the original Meatballs) involves the on-again off-again romance between Fanny (Misty Rowe) and Jamie (Archie Hahn), a couple of camp counselors who are always planning someplace to go and make out, but always end up being frustrated with pranks by the kids or by people barging through the locations of their trysts. Also a romance between Flash and Cheryl (Kim Richards) a camp girl from a parochial school slowly develops. At first she thinks he’s a dork, but after she sees him box, she begins to warm up to him.Their romance begins to heat up when they meet at the camp dance. Later, both Flash and Cheryl are tricked into meeting by the lake by Cheryl’s girlfriend Nancy (Tammy Taylor). Flash thinks that Cheryl wants to go skinny dipping but she thinks they are meeting to look at shooting stars. A bear appears and scares Cheryl off after Flash gets in the water. Then the naked Flash is grabbed by Hershey’s troups and locked up in Lt. Foxglove’s office, where the only clothes available are dresses (go figure!). So the next day Flash shows up to the fight wearing his chucks and a black dress. You can imagine the response to this by the crowd at the match and what happens next in the “Rocky meets E.T.” fight that follows. 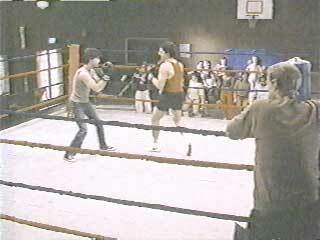 The rest of the film is about the boxing match and the resolution of all the subplots. Flash brings the paddles in from the lake. Meatballs Part II is pretty standard adolescent fare, with a few twists thrown in. The story line doesn’t make a lot of sense, and is more or less a skeleton to provide titillating dialogue and risqué situations designed to appeal to its targeted teenaged audience. The characters are pretty much stock characters, but there are enough of them with some funny bits to keep your interest, as long as you don’t try to make any sense out of this film. The film is rated PG but should be PG-13 due to the excessive sexual innuendo, crude jokes, and cross dressing implications. The cross dressing element doesn’t ring true (after all if the macho Flash could find his chucks and socks, couldn’t he find some trunks for the match somewhere, or ask for some before he got into the ring?) and any explanation of Lt. Foxglove’s involvement with this in the story line was cut from the final edit. Director Ken Wiederhorn’s hand in this film seems pretty weak with the final result that Meatballs Part II comes across as the product of a 1984 marketing committee, not the work of inspired comedy writers. Flash meets Meathead for the first time. 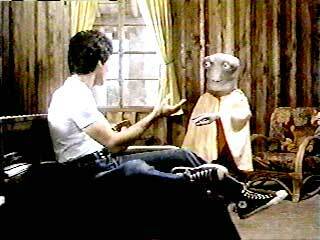 Except for the opening sequence, you see Flash wearing Chuck Taylor black high tops throughout the film, and several of the kids in Flash’s cabin and his friend Eddie (Ralph Seymour) also wear them. There is are some good chucks shots during the fight sequences although the main one is pretty ludicrous. The best scene is probably when Flash meets Meathead for the first time and he thinks that he is hallucinating. Flash thinks at first that he is hallucinating. Meatballs Part II. (1984) Richard Mulligan, Kim Richards, John Mengatti, Misty Rowe, Paul Stout, Scott Stout, Ralph Seymour, Jason Hervey. Directed by Ken Wiederhorn. Categories: Comedy, Teenagers.